An Oklahoma sailor who perished that day identified...to be laid to rest today at Arlington National. 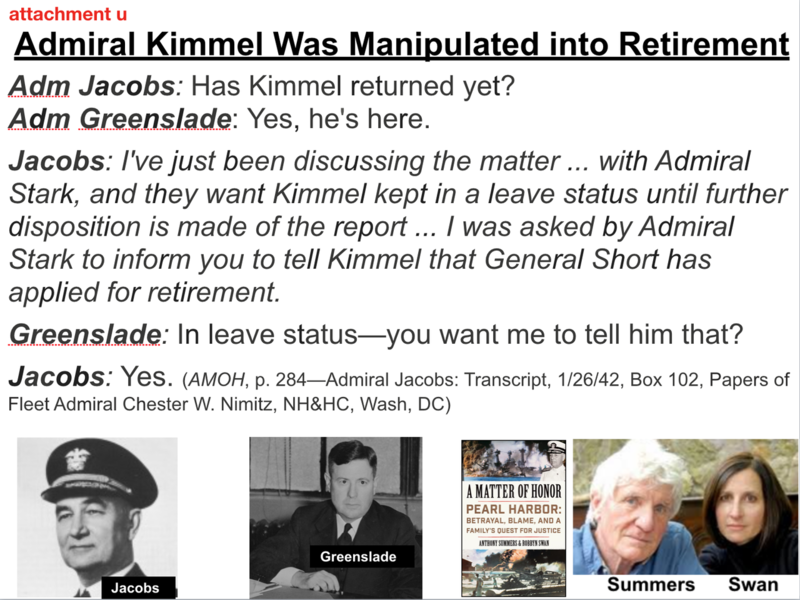 The Kimmel family has been doggedly from the start been proactive in striving to have justice done for the reputations and retirements of Admiral Kimmel and General Short. 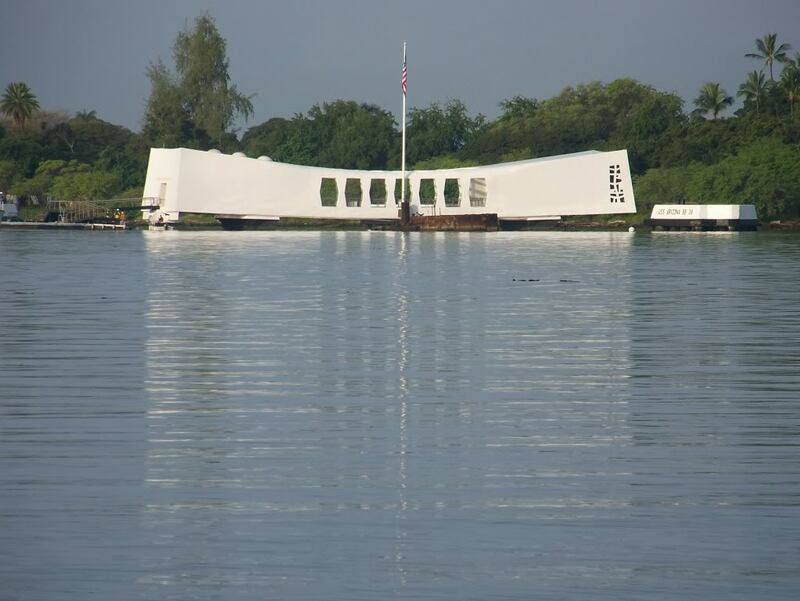 They have the support of the Pearl Harbor Survivors Association and it would be nice if some of the survivors of that day can know their government no longer blames their commanders for the death and misery suffered by their fellow sailors, soldiers and airmen. But so far we are on the 13th President to do nothing about this sad story. *FDR established the Roberts Commission on Pearl Harbor under the specific instruction to focus solely on derelictions and errors of judgment on the part of the Army and Navy personnel...and the commission took pains to declare (in Conclusions 2-6) that the Secretary of State (Cordell Hull), Secretary of War (Henry Stimson), Secretary of the Navy (Frank Knox), Army Chief of Staff (George Marshall) and the Chief of Naval Operations (Harold Stark) had all fulfilled their obligations during Pearl Harbor and had committed no breaches of service. The latter is ironic, given Marshall's confusing warnings leading up to the Japanese attack, the emphasis upon sabotage being the primary concern echoed by everybody reinforces this subterfuge by leaders who were literally all reading the Japanese diplomatic intercepts and even when knowing their intent was to attack had hours to properly and directly warn their forces on Oahu failed to do so and the dubious machinations of the Marshall warning that arrived conveniently late to do a damn thing about. The Roberts Commission declared that Admiral Kimmel and General Short were guilty of "dereliction of duty" though there was no evidence of that let alone presented in Courts Martial like manner, as stated earlier FDR limited the scope of this review and barred Magic intercepts that Roberts admitted he wouldn't have accepted had he known about them and been provided them. Not even the Congressional inquiry was willing to go so far with the scapegoating of the Roberts Commission, though members were pressured to maintain a consistent 'dereliction' theme they opted instead for a waffling "errors of judgement" over blanket condemnation. *Several dozen Admirals plead to have this injustice rectified, including Arleigh Burke, Thomas Moorer, Elmo Zumwalt, James Stockdale, William Crowe, Jr, Stansfield Field Turner. Several politicians also sought action on this, ironically John McCain who was ignored by fellow Navy man and WWII fighter Pilot G.H.W. Bush as well as his son, and Hegel as SecDef under Obama! 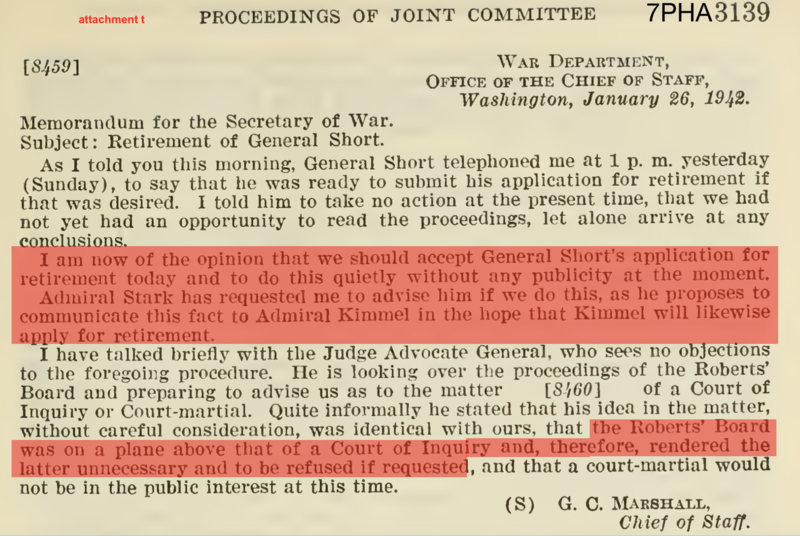 *It is also clear that the FDR/Knox/Stimson allies in the Navy Department used the retirement of General Short as the preferred vehicle to pressure Admiral Kimmel...a Marshall-Stimson memo seems to bear this out as well as have the added JAG opinion that the Roberts Inquiry trumps any Navy Department Inquiry or Court Martial! No admission ever surfaced from then to now who leaked the requests for retirement submitted by Short & Kimmel to the press...thus making them appear to be falling on their swords. They were put in a no-win situation, Kimmel admitted to not wanting to damage the Navy or the Administration at a time of war but also felt his public crucifixion was becoming unbearable was was getting numerous death threats. *The retirement option above was seriously desired by all the key power brokers outlined in the preceding point and the third thing working in their favor was exploiting the patriotism of Kimmel and Short to do the right thing for their service and bring no harm upon them or their boss the President at a time of war. The last thing any of them wanted was a Court Martial where any of their culpability might be examined...which most if it (the magic intercepts in particular) would never see the light of day in any proceeding, but the risk of details getting out and shot callers being exposed could end careers and it would be easier to scapegoat Kimmel and Short by simply ignoring them after the Roberts Commission deemed them derelict! Yes, it is easy to scapegoat patriots, to label them derelict and erroneous in judgment when not given all the facts necessary to do their jobs and when not given a fair hearing of the facts. I am no expert on Pearl Harbor but read a couple books in the past years. I do not blame the local commanders, except for the clueless MacArthur. I recall that Billy Mitchell was on a much earlier trip to Asia, maybe with his wife. He predicted the day of week and the time of a Japanese attack on Pearl Harbor. He predicted an attack the next day at Clark field. He was off by an hour. I read a dry detailed book on how the US was financially strangulating Japan, by the Naval Institute Press. It was mostly new to me. Another book 1941 made it clear that all Japanese reports predicted they would lose any long war with the US. In hindsight, if they were going to attack, the Japenese made a mistake by not going back and destroying the ship repair yards etc. 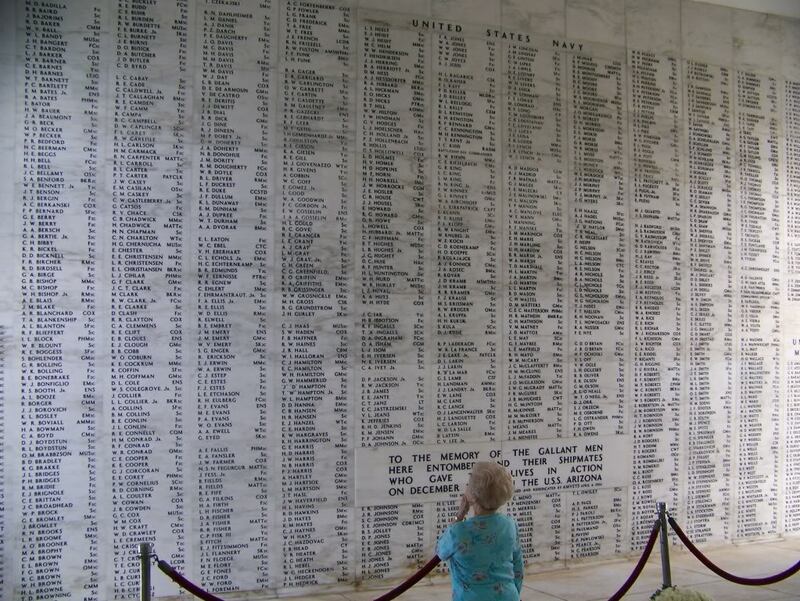 at Pearl Harbor. They also missed the fuel depot too, that and the dry docks being intact allowed the US to repair and reinforce. They also waited too long to follow up on it...and part of that can be laid at their invasion of the Philippine Islands...the Filipino people and the Americans stationed there were sacrificed to buy time for those repairs at Pearl and for the amped up war-time economy turning out new ships, planes, tanks and arms. I don't know how detailed Mitchell's predictions were, there were a handful of people who tried to warn people of Japanese imperialism and of coming threats to America and bases overseas. Interestingly, his father served with Arthur MacArthur...fortunate for America he entered the Army and basically created American military air power, toured all over what would be future battle zones in Asia...and though the unfortunate Shenandoah affair ended his career in 1925 he continued to be a strong advocate of air power. The sub thing is interesting, late in the game the Japanese I-400's came along, and four of these 3-bomber carrying boats set sail for a mission to bomb the Panama Canal but the mission was scraped because of the fall of Okinawa and they were instead dispatched for a campaign at Ulithi Atoll where American carriers and others were gathering for a push against their home islands. Mitchell should have been aware of all aviation pioneers...Capt. Washington Irving Chambers who made it possible for Geroge Ely to demonstrate shipboard tack of and landing possibilities, pioneers in naval aviation like Kenneth Whiting who became the first commander of the Langley (CV-1) and another Wisconsin boy who would be an essential leader - Marc Mitscher, who gained fame with a trans-Atlantic crossing, was a vociferous advocate of air power along with Admiral William Moffett while stationed in inter-war Washington DC and interestingly enough resisted Mitchell's call for a single unified aviation command...which was fortunate as it could have killed carriers and naval aviation that largely won the pacific. Mitchell himself demonstrated quick effectively how planes could destroy ships, and the pioneers of naval aviation took note and responded logically to the threat by creating the means to conduct offensive and defensive operations. The economic embargo measures put on Japan before the war as a response to aggression in Asia, particularly China may be viewed as counter-productive but only from the standpoint that the resulting diplomatic negotiations were doomed from the start. In hindsight it is pretty obvious a militant Japan would expansionist and that an isolated America would be complacent to a vague far away threat from an assumed backward nation. Enough people warned, and if it was FDR's desire to stoke Japanese anger to get America into a war with the Axis...well, just fuels the conspiracy theories, yes? There were warnings by a one-time crime reporter, naval intelligence officer, FBI agent and cartoonist and no larger warning was issued than that of British author Hector Bywater in his 1925 novel "The Great Pacific War". It seems clear the latter, while off on several technical points, was an influence on Yamamoto, in combination with his own experiences in America and of the Battle of Taranto of November 1940 in particular.